Football - Illingworth St Mary's v Hebden Royd Red Star. Michael Gregory for Illingworth and Dan Pugh for Red Star. 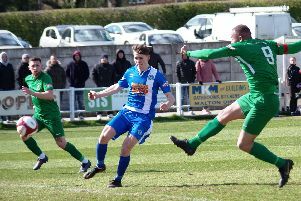 Brad Waddington scored twice in a man of the match display as Ryburn United won 4-1 at Shelf FC to advertise their Halifax AFL title credentials on Saturday. It means Craig Walker’s side have dropped only five points in the first half of their Premier Division campaign and have a handy four-point advantage at the top. Challenge Cup holders Shelf are the rising stars of the league but their young side were put in their place at Westwood Park by a Ryburn side providing a perfect response to their shock 2-1 defeat at Midgley a fortnight earlier. Christian Silkstone and Owen Wilkinson got the other Ryburn goals with Matthew Hartley replying for Shelf, who had also only lost once in the top flight this season before Saturday. Second-placed Shelf United completed a derby double over Northowram, who have now lost their last four games, with a slightly-flattering 3-0 win on the artificial surface at Lightcliffe Academy. The Rams, quicker to the ball and playing some tidy football, had the better of the first half. Matt Calland, who linked the play intelligently, was denied as he tried to flick the ball over the advancing keeper and Billy Farrell miscued when well placed. Shelf, despite some neat touches from Billy Grogan, were for the most part on the back foot. David Chappell hit a post early on but they offered little goal threat other than forcing stand-in keeper Daniel Collins into a smart save low down from Chappell’s well struck shot. The home keeper somehow kept out Ash Smee’s fierce drive and it was looking odds on a goalless first half when Collins allowed Chappell’s tame shot to bounce in. Two goals in the first 15 minutes of the second half put the home side in the driving seat. The first came despite vociferous claims from the Rams’ defence for a foul in the build-up as Luke O’Brien ran free down the left and his low cross provided a tap-in for Chappell. O’Brien scored the third from close range and James Waggett missed a good chance to increase the lead when he put a free header over the bar. A superb piece of skill from the otherwise tightly-marked Lewis Oldridge left two Shelf defenders stranded but his angled shot flew well wide and substitute Sammy Gee had his effort saved at the foot of the post. When Hebden Royd Red Star and Illingworth St Mary’s met a fortnight earlier in Mytholmroyd a 9-1 rout was the outcome. Saints fared much better in the rematch at Trinity Academy at the weekend, two goals each for Joe Griffin and Luke Prosser earning them a 4-4 draw. Star faced a strong wind in the first half on the artificial surface and went a goal down to a Griffin header. Lewis Cockroft equalised from a tight angle with a left-foot shot across the keeper but last year’s champions took a 2-1 lead into the interval after Star lost the ball in midfield and a long ball enabled Prosser to strike. Dan Pugh made it 2-2 from the edge of the area and when Red Star hit the front from Tom Barclay’s close-range volley, the visitors were feeling confident. However, Griffin made it 3-3 from a quick break and although Pugh eventually took advantage of an opening following a free-kick with 10 minutes left, Prosser had the final word.